Supporters of a stately home fear it will be sold off after it failed to win a £3m lottery grant. 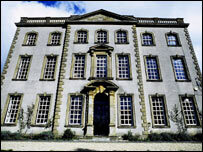 The Heritage Lottery funding would have paid for vital restoration to the Grade I listed Sherborne House. Now campaigners fear that unless a benefactor comes forward, it will be sold off by Dorset County Council. The county Council, which owns the building, declined to comment until it has received more information from the Heritage Lottery Fund. The grant would have paid for a new roof at the 18th Century house, which attracts more than 25,000 visitors each year. There were also plans to create a regional art gallery, with print studios and exhibition spaces, which would have helped regenerate the area. Sherborne House Trust chairman John Miller told the BBC News website: "This is so, so devastating. The building now faces a very uncertain future. "The building is now left with scaffolding around it and tarpaulin on the roof. There's a possibility that Sherborne House will be sold. "Our only hope is that a very generous benefactor comes forward."